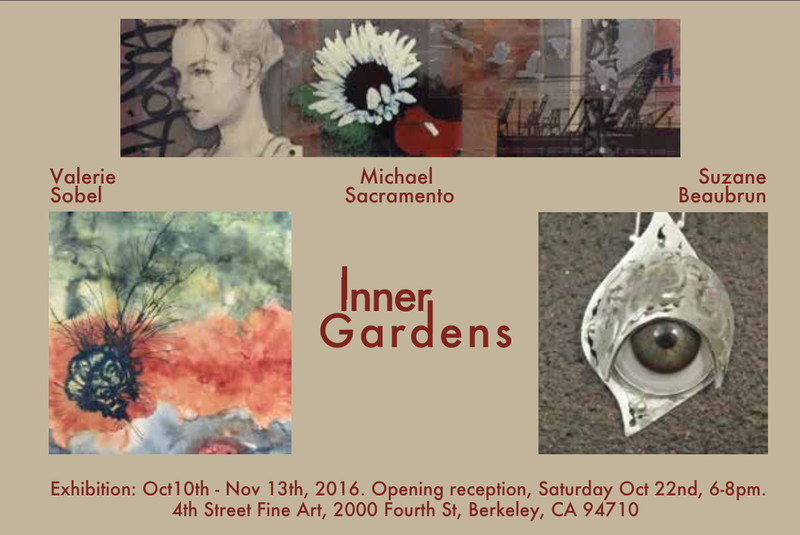 4th Street Fine Art is proud to present the newest show Inner Gardens. The show has new art from our artists Valerie Sobel, Michael Sacramento, and Suzane Beaubrun. All these artists have the element of travel in their life whether it was growing up in a far away land like the Philippines or Northern France coastline or living in New York City and travelling to New Orleans. Recently, Valerie has been exploring pure abstraction in her latest watercolor on paper. She originally worked in fantasy portraits and animals of her own unique design. She comes from the countryside of France and brings a unique European flavor to the gallery. Her work explores the juxaposition of the mineral, animal and human in the primordial soup we call life. One of the challenges going into the show was balancing time between this project and a mural project she is working on at a local gaming store with the goal of attracting girls into playing medieval games and discovering the strength of their femininity. He grew up around the Bay Area and would travel his city by bus. In his travelling, he would see the unique language of graffiti tags, which represent an art child marking his territory as well as challenging other artists to tag battles. Originally, he got his start at 4th Street Studios, our original warehouse gallery on 4th Street. His earlier work delved into portraits and toys of his childhood in the 80s: Transformers, Rubix Cube and a spinning top for example. He always had a passion to draw women portraits and use them in paintings. Here we see Michael expanding his repertoire of blending the beautiful women portraits with the found graffiti language of the Bay Area neighborhoods along with flora, birds and unique backgrounds like the cranes of Oakland, famously used in making Star Wars - Empire Strikes Back. Suzane comes from the Bay Area as well. Her latest jewlery design has taken on the language of the street as well with necklaces made with found items like bottle caps and bicycle intertubes. She incorporates tradional jewels and metal into her work as well as these new urban language. The goal of using these urban elements is the idea of up=cycling, using items traditionally discarded and transforming them into art you wear. She has a BFA in Sculpting and Painting and grew up under the tutelage of Lisa Spiros in New York City. Her latest designs may have been influenced by an amazing journey to New Orleans, where she saw art being made out of zippers by the Zipper Queen.